Ladies and gentlemen! My name is Mantid Man, and I am not only a member and representative of Team Rankstar, but also an advocate for the entirety of the Eternal Community! As such, I wanted to bring you insight into individual members of the community. Not only personalities and champions, but also streamers and everyday active members of the community. Most Disliked or Damaging Card in the Game: That’s a tough one. I do think teacher of humility is the most egregious one, though the combination of Alessi, Crownwatch Press-Gang, and Stand together combined can be really frustrating to play against. One Eternal Wish: Sideboards! Anything else seems small in comparison. Now that the quickfire is out of the way, lets get to the meat! MantidMan – Ilya, thanks for taking some time to talk to me! This is a new series that I am starting up, I want people to know some of the personalities in the Eternal Community. I would love to get to know you a bit more just as a person, to start with. Can you tell me and the DOZENS of people who will stumble across this about you as a person, maybe a little background? Ilya K – Hm, okay, so I’m a veteran Eternal player–I’ve been playing since closed beta, and have accomplished, let’s just say, a lot of what there is to accomplish in Eternal. 10,000 PvP wins, finished rank #1 on ladder twice, played in the first yearly community tournament world’s tournament, and generally finish in the top 100 of constructed master, and as of recently, top 100 draft master as well. By profession in the real world, I’m a “quant”, of sorts. I use statistical programming to try and find ways to make money in the financial markets for various people. MantidMan – Wow, an incredible Eternal resume for sure. I will come back and touch on a few of those points for sure. Until then let’s take just a quick step back and jump into your profession from a surface level. “Quant” , statistical programming, financial markets, money… these are all words that are foreign to a lot of people, myself included. How do you get into something like this? A fan of numbers and data I would assume? Ilya K – Correct. I’ve liked numbers for a long time, and I always wanted to know how to use them to make money. As for how to get into something like it, well, it starts with a technical master’s degree from a university, and then, I can’t speak for others, but I got there by being publicly visible with blogging about systematic investing. MantidMan – Sounds intense and I wish you as much luck as you need in that. So if you made yourself publicly visible in that space too I would say that you have a knack for it. It would not be a far cry to say you are a bit infamous in the Eternal Community as it stands, never afraid to speak your mind. Before Eternal hit the scene were you into any other TCGs or CCGs? Ilya K – Famous or infamous depending on who you ask. The CCG I played before Eternal was called Alteil, but it died due to a horrific business model. That was quite a few years back. Prior to Eternal, I was playing some Path of Exile, and found out about the game thanks to Brian Weissman. MantidMan – I heard little wisps of information on Alteil when it was around but never got into it myself. But, you bring up an interesting point: the survival of a game not based solely on community or even the gameplay but rather the foundation it is built upon. Can we touch briefly on your “outside-looking-in” opinion of Eternal and how it is progressing forward? Especially with the advent of Twitch Drops and this new Prime bundle they have announced? Ilya K – So, let me say this loud and clear: when it comes to creating a welcoming environment as far as card acquisition goes, Eternal is the most welcoming F2P game I’ve ever played. While I’ve certainly played the game more than most people, even after having cut down the amount I play by a very large amount, I find that just doing my daily quests and spending the gold cautiously on limited allows me to have immense amounts of resources for building whichever competitive deck I want. The Twitch Prime promotion is similarly terrific from a new player’s perspective. 35 packs is worth around $30, give or take, and should be enough to get new players experiencing the game of Eternal in short order. If I recall correctly, there are guaranteed legendaries involved as well. In any case, from this promotion alone, new players may be able to get close to crafting a single competitive deck with a couple of legendary cards in it if they’re careful with how they spend their shiftstone (crafting currency). Additionally, after having recently tried some Magic: the Gathering programs online, even MtG Arena–Wizards’ latest offering to try and bring magic online, I realized just how much better Eternal is as an online card game than its competitors. While Magic has a storied history, full of phenomenal metagames, and famous mistakes that somehow happily coexist in various formats, Magic has yet to make a good online transition. In contrast, the actual playing of Eternal is a very smooth experience, with some very innovative mechanics that can only be done in a digital space, and with the computer taking care of a lot of the minutiae of the game’s mechanics to make for a much smoother game flow experience than Magic brought online. It does make one appreciate just how the human mind is able to shortcut so many tasks while playing a game of paper magic, but that does not translate well online. Beyond the generosity and the game flow, however, my opinions are more mixed. Eternal’s developers have a very particular vision for how they wish their game to be played. Eternal places a very heavy emphasis on gameplay that revolves around units/creatures/minions (called units in Eternal), and the board state generated through playing and removing them. If this is the type of experience you seek, Eternal will offer you a vast array of options as to how to play units of various sizes and interact with your opponent’s units in a myriad of ways. However, if you’re the type of player that likes to go off the beaten path, and play something more novel, such as a prison control deck, or a hyper-aggressive deck, you’ll quickly find yourself stymied. 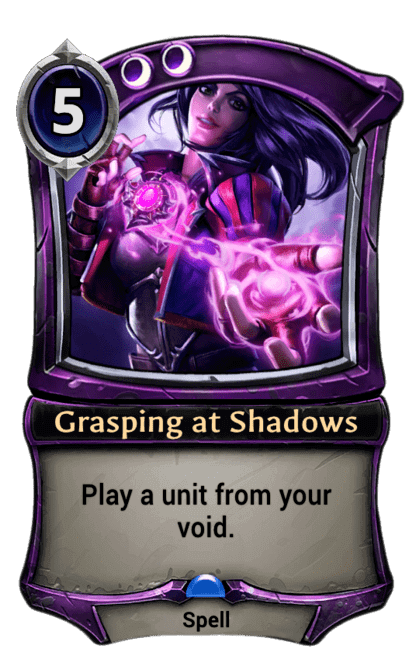 The track record for unconventional strategies in Eternal is fairly poor, and some decks such as Reanimator (generating a tremendous advantage by playing a large unit for cheaper than normally casting it by summoning it from the discard zone, called the void) suffered severe nerfs that rendered past versions unplayable. Tools to combat highly reactive decks are also exceptionally strong as to discourage that style of deck. Lastly, I am not quite sure of just how far Direwolf intends to raise the skill ceiling in Eternal. In many different card games, in a tournament setting, both players have the ability to remove cards bad for the match-up from their deck and bring in more specialized cards. While the first year of community tournaments used this process, called sideboarding, Direwolf never supported it. With the release of set 4 (Fall of Argenport), Direwolf intends for the market mechanic to be their answer to sideboards. You access the markets by playing a unit that you can first normally play on turn 3 (absent some ramp), and exchanging a card in your hand with a card in the market that shares a color (called a faction in Eternal) with the merchant. However, the element of timing introduced by these units causes them to be used to further push a deck’s proactive plan, rather than react to the opponent’s plan, in many cases. As the market can only contain five cards, this means that there is very little space to put more specialized answers, and that more conditional cards suffer. This may lead to a greater incidence of matchups decided by which decks players are playing, as opposed to how they play those decks, which does not bode well for a competitive experience, in my opinion. However, this last set has given me some confidence in Direwolf’s ability to improve things going forward. But at the current point in time, my opinions are mixed. MantidMan – I am a silver linings kind of guy, if that has not been plainly obvious from my other submissions to the Eternal Community. I have to say that even though you tend to come off harsh or cross sometimes, you do so from a place of extremely detailed knowledge, insight, and some would even say, passion. I commend you for that! You did just give me a lot of insight into your thoughts on the game as a whole (obviating a couple of questions), but lets be honest, that just makes my job easier here. Right now the competitive scene (outside of Chapter Events and the Ladder) is exclusively community driven. We all know that Dire Wolf Digital and the Eternal team (henceforth DWD) is working on the competitive side of the game. If you could make a single recommendation to them, what would it be? Ilya K – Well, in a word, sideboards. Now while the conventional implementation may not work particularly well with the market mechanic (i.e., imagine every opponent just had that 1-of silver bullet for your deck in ever match because they have 4 or more chances to fetch it with merchants), a way for more reactive decks playing more conditional cards to remove them for different conditional cards based on their opponent would be nice. That is, imagine the control player, who expecting some number of aggressive units, played some number of cards dedicated to the early game, only to be matched up against another player playing a similar strategy, but who has the advantage in the match-up without being able to do these substitutions. One player will be looking at a hand full of completely inapplicable cards, and that’s a miserable feeling. I’m of the opinion that the more strategies any one player can adapt and counter-adapt to, the more diverse of a metagame Direwolf can allow to exist. The more diverse the field of viable strategies, the more types of players that Eternal can welcome. 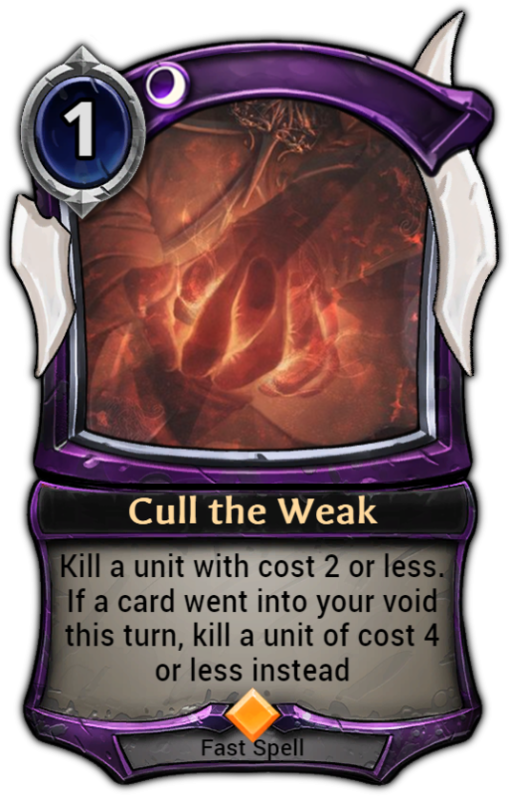 What if you’re not the kind of player that likes to play a unit-heavy deck? Are you simply unwelcome in DWD’s game? I don’t think that’s a great policy. 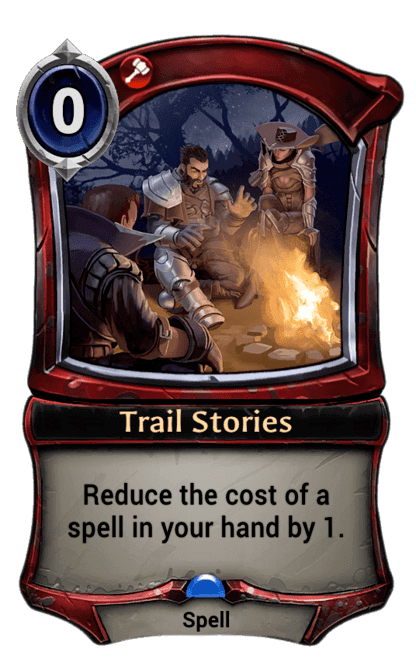 MantidMan – I can get behind that sentiment, it would be interesting to see how they would implement that if DWD took that to heart. Well, Ilya, it has been a pleasure discussing the ins and outs with you. I know I learned some and I hope our readers have as well. There is a lot on the horizon for Eternal and the Community as a whole that I cannot wait to see. Before we call it, is there anything else you would like to say, to the community directly? Ilya K – Not at this particular moment in time. I’m sure I’ll come up with something in the near future, however. MantidMan – I am sure you will! It was very eye-opening for me in doing this interview with Ilya K. I really enjoyed it and I look forward to the next one. If you have any suggestions for who you would like to see in future editions of Trail Stories, let me know on my Twitter! 1 Pings/Trackbacks for "Trail Stories: Ilya K"